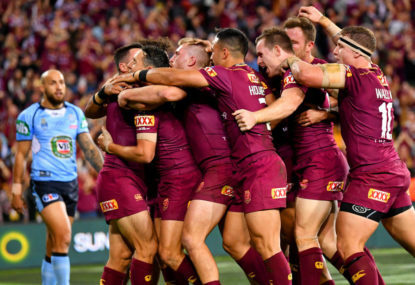 The Queensland Maroons have won their 11th State of Origin series in 12 years, completing another year of the dynasty with a 22-6 win over the NSW Blues in Game 3 at Suncorp Stadium. The Maroons played a clinical opening 40 minutes of rugby league and were unlucky not to take more into the halftime break than their 12-0 lead. A double to Valentine Holmes in the first half an hour had the Blues reeling but Cameron Smith and Cooper Cronk both missed out on big chances to get over the line late in the first stanza. The Blues fought hard in the second half to come back in the game, reducing the gap to six points thanks to a flying effort from Josh Dugan in the 48th minute. 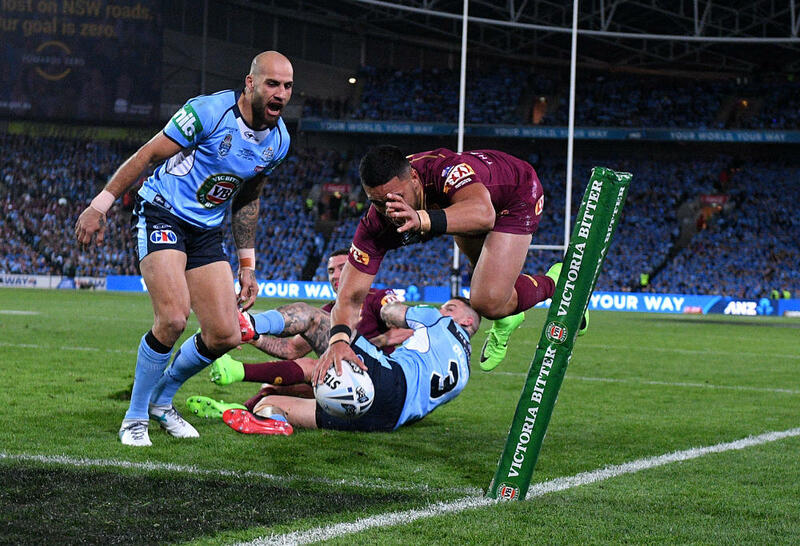 Failure to capitalise on a period of pressure on the Maroons line came back to haunt New South Wales as Holmes completed the hat trick with 19 minutes to go. Jarrod Wallace continued to bring the pain just over five minutes later to take the game away from the Blues and seal the series. The Blues played beautifully for one and a half games and looked like a genuinely strong side that could put an end to the dynasty. They then proceeded to play terribly for one and a half games. With Game 2 and the series in their hands at Sydney, New South Wales capitulated under pressure and they gave it away. That same form of capitulation carried right over to Game 3 and they were run all over the shop in Game 3. They looked like the same side that was stumbling their way around the park at the back end of the second game, as if they were still suffering from the hangover of a demoralising defeat. A spirited fight in the second half wasn’t enough to overcome the same kind of footy that cost them so dearly in Game 2. As soon as Holmes had his third, they looked lost, they looked like they were already beaten despite still being well and truly in the game in terms of the scoreline. That’s the difference between the two sides. When Queensland were behind and reeling in Game 2, they rallied, they fought and they won. New South Wales slip behind and they collapsed, they fell, and they lost. Despite all being born in 1983 and certainly sitting in the elder statesman side of the dressing room, Cameron Smith, Billy Slater and Cooper Cronk proved once again why they are three of the greatest of all time. While the Blues may have come out in the first half with plenty of hope and aggression, it was the magical trio that quickly sucked the life out of them with relentless and clinical footy. The first half, in particular, was a masterclass with Smith running out of dummy half and racking the metres, while Slater was a never-ending source of support on the inside and across the park. Cronk had the Blues defence in tatters, leaving them sliding sideways and backwards as he took on the line, played on the inside and outside, leaving New South Wales with no idea what he had in store for them next. His crossfield kick to Holmes for his second in the opening half was as pinpoint as it was quick-thinking and perfect for the situation, showing off the big game knowledge and pressure absorption he’s become famous for. Slater was a star in attack and it was the usual burst of acceleration through even a hint of a gap that had the Blues scrambling all over the shop. He was still running around in broken play late in the game, proving that his legs may be short, but they still have plenty of endurance in them. With Slater missing Game 1 and Cronk looking like calling it a day after this season, many would be forgiven for thinking they were on their way out and not up to the Origin arena at this stage of their careers. The amount of times the commentators were saying Smith, Cronk, Slater in succession was getting ridiculous by the end of the game, but the fact is that that triple combination continued to work time and time again. How oh how do they continue to prove us wrong. Valentine Holmes the next Origin legend? From the veterans to the next generation, at just 21 years of age, Valentine Holmes has had the perfect start to his Origin career. He has played just two games after making his debut in Game 2. From those two games he has two wins, a series victory and a slightly ridiculous four tries already. Is that enough to call someone a future legend of the game? No way, but as sports fans we love to speculate till the sun goes down and rises again so that’s what we’ll do. Who else can you remember having such an explosive start to their rep career? Greg Inglis, Wally Lewis, Jarryd Hayne, Jonathan Thurston. There is an elite group of players who have been able to take to State of Origin like a duck to water and nearly all of them have gone on to become some of the best Origin players since the interstate rivalry took off into a new era in the 80s. He’s not just the beneficiary of a super side on in his inside either, he’s able to show off his incredible finishing skills in tight situations, soaking up the pressure of the game. Ah, poor old Mitchell Pearce. The man has played 17 games across 10 years and hasn’t won a single series. He’s the easiest target of them all in every post-game wrap and series defeat for the Blues purely because of his severe lack of winning. Pearce didn’t particularly play terribly in Game 3 but he has the unfortunate task of being shaped up to his opposite number in Cooper Cronk. Cronk won his side the game and the series, Cronk took control of his team and demanded they follow his lead, making Pearce look terrible for his failures to do the same for his troops. There’s no doubt Pearce will cop it from the media and the fans for another failed series venture in the halves and while he has struggled at times in Origin, his 2017 series shouldn’t put him in the scapegoat role again. The team as a whole ran out of gas in Games 2 and 3, there were countless other players who continued to make mistakes at the wrong times and give away penalties. This series loss was a team effort, give Pearce a break. The Maroons have now won 11 series in the last 12 years and that is just insane. Seriously insane for a team to dominate so convincingly for so long in any code of sport. 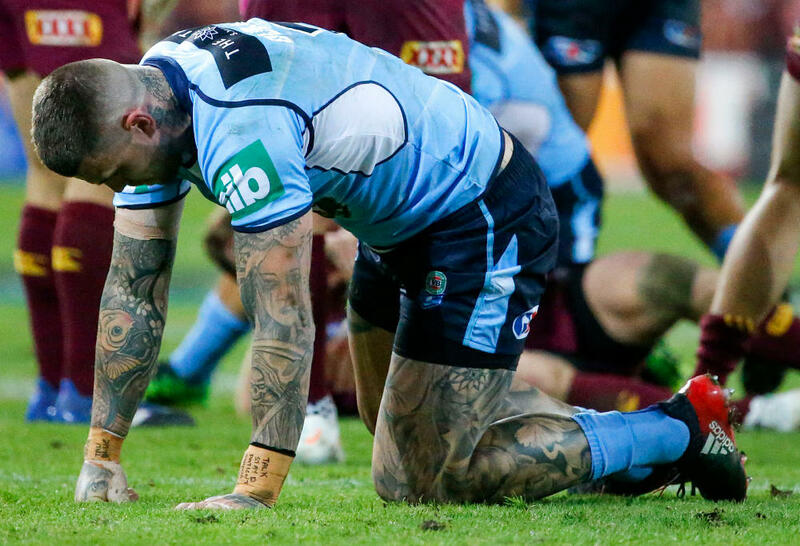 The worst part about it for New South Wales is that it’s not going to end anytime soon. Just look at the depth the Queenslanders have, just look at the way they are coached and the way they play under pressure. The culture of their dominance and the way they make it look so easy. It’s going to take a long time to turn that around for the Blues and more series losses like this will continue to hammer their confidence, even leading into next year and beyond. The player depth is outrageously superior to that of their southern neighbours and they will continue to drive them through the ranks year after year and blood them into the next generation of champions. Good luck New South Wales.